Once a year, the students of The French Piano Academy have the opportunity to perform in front of a live audience. While this is not a mandatory obligation (the choice ultimately falls on the pupil himself), these concerts represent an ideal venue for those who want to demonstrate months of hard work and focus. 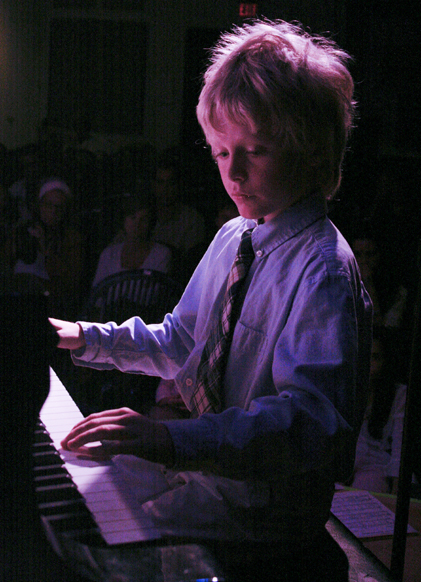 From easy / intermediate level Broadway tunes to more demanding Film, Classical and Jazz pieces, not only do these events offer our students with the opportunity to impress and conquer their audience, they also help each one of them in strengthening their confidence, ego and eventually winning over stage fright. Because our concerts do not feature a Jury, they shouldn't be considered competitions: each pupil is given equal stage time (one piece alone and one piece with the teacher or another student) and it is the responsibility of each performer to choose a musical composition from a common pool of thematic material (as each recital follows a particular theme). More importantly, it is always ensured that the selected tune is of an adequate difficulty level so that the apprentice both enjoys and feels comfortable with his upcoming performance. Each program concludes with a highly emotional trophy distribution where all participants are called in alphabetic order to ensure equal treatment. Always present, the official photographer of The French Piano Academy ensures that these moments are immortalized (a selection of stills will be featured on the Academy's web site shortly after the event). A late brunch will be offered, complete with pastries and beverages, bringing a closure to this unique ceremonial.